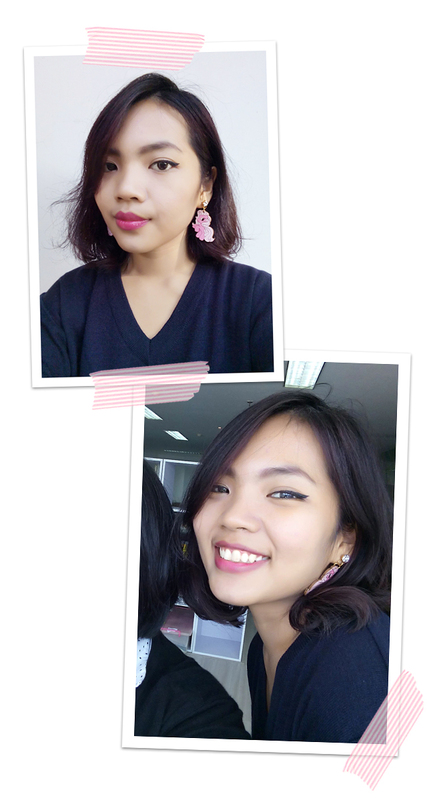 Take a Look by Dinda Puspitasari: What's Your Personal Style? Whenever I get that kind of question, I find my self confused in collecting words to answer it. I can't describe my personal style in one word. It really depends on my mood during the day. One day you'll see me wearing all oversized, one day in flare skirt, one day I go casual, I feel like I'm wearing all types of clothes, except the very tight ones. My sister usually call my style as the quirky one, but I don't really see my self in that term. I love blacks (and other monochromes), I love to dress my self in black from head to toe. But I always put one key item that steals attention, like patterns, big earrings, playful necklace, or statement shoes. One item that pops. A few days ago, I came to a style workshop by Lenovo and Gogirl Magazine. There were a bunch of fashion bloggers and we were discussing about personal style. Its quite fun to see a group of stylish people all at once. We were then introduced to Lenovo S850. Lenovo was my very first laptop when I was in college, so the brand itself has 'something' to me. I never used an Android before, so I was very curious with this smartphone. On the first glance, it looks so stylish with the glass surface. Apparently it has 3 colors available, white, dark navy (I thought it was black), and pink. 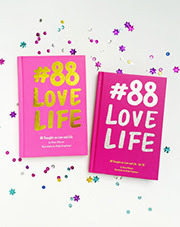 Luckily I got the pink one, YAAAAAY! 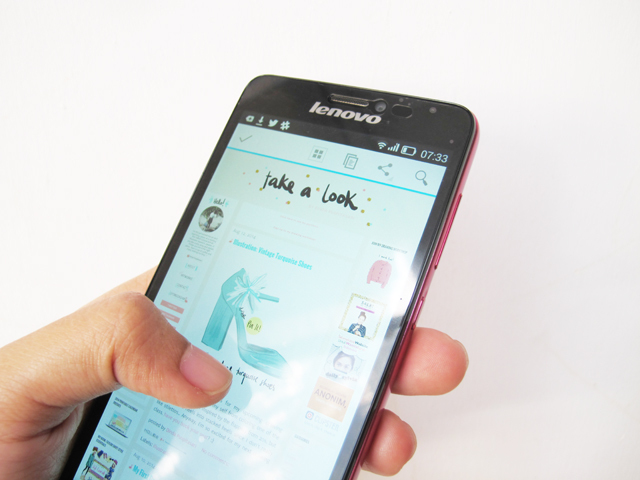 The minute I started using Lenovo S850, I'm in love with it. No I'm not exaggerating, here I tell you why.. The design is very slim and chic. The size is also perfect, not too big and not to small - and it's very light! Its only 140gr, which is the same weight as two eggs. I was soooooo amazed with the wide screen (it's 5" wide-view HD screen, no wonder). I can see bigger pictures on my phone, without zooming in dramatically to catch the details. Lenovo really got me on this point. The color, pink complements my style perfectly. It just pops nicely between my monochrome attire. The glass surface is making it looks so chic! The built in cameras. The back camera is 13 MP and the front camera is freaking 5 MP! All I can say is I'm in love deeply with the cameras. The panoramic feature on the back camera has a simple and useful guide to stitch the pictures into one panoramic photograph. The front camera, oh I really love it. It makes me feel prettier hahahahahhahaha. Have a look on the pictures below. I've been using it to take selfies with my friends for the past 2 days and they were addicted to take selfies with my Lenovo because of the excellent result! This is what makes me so attached with my pink phone. Surprise surprise..! Lenovo S850 has two sim card slots. I didn't expect this feature, nice one. Back on the style topic, if you often read this blog, you might knw that my fave colour combination is black, white, and pink. I'm so glad that I got this pink Lenovo, so I can mix and match with my outfit. 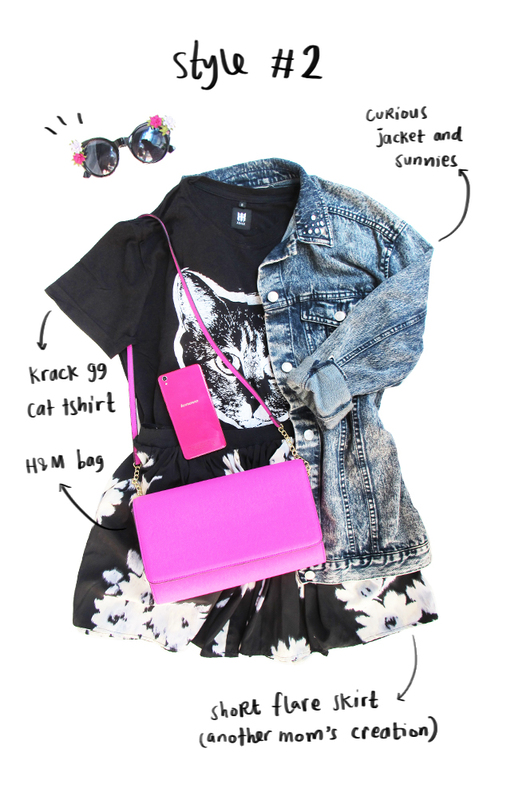 So here are my outfit ideas to match my stylish phone! Anyway, how do you describe your style? 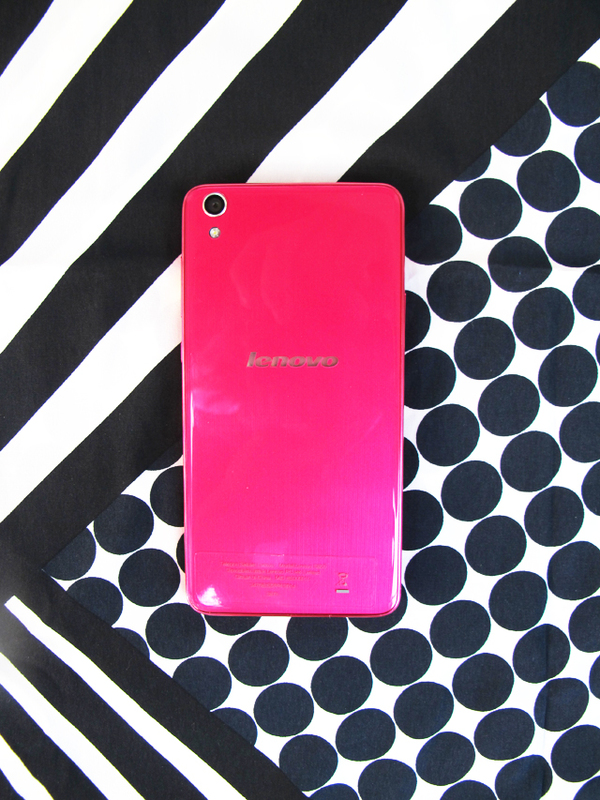 If you have the pink Lenovo S850, how would you style your self to match the phone? Tell me, I'd love to know! You can check the hashtag #StyleSnapShare or #LenovoStayInStyle on Instagram or Twitter to find out the stylish personalities who use Lenovo S850 too. Until the next post, see you!